A host of special sights, sounds, and activities are in store for visitors at the grand opening weekend of Secrets of the Silk Road. Camels will be circling the Museum, stopping for guest encounters and hourly presentations about life along the ancient routes. Central Asian silks, textiles, furniture, and other trading route goods will be for sale in the Museum Shop. Enjoy performances, craft demonstrations, and a caf� with tea and Chinese pastries inspired by ancient foods in the exhibition. The Museum's third floor will be transformed into a Silk Road "oasis," created for the weekend only, featuring Central Asian silks, textiles, furniture, and a central market cart piled high with trading route goods. 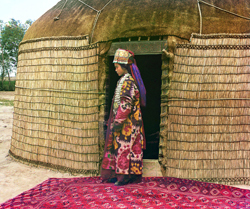 Visitors can explore two yurts—portable, wood lattice-framed dwellings traditionally used by Central Asian nomads. Two Bactrian camels (at ease in blistering heat-or freezing cold!) circle the Penn Museum, stopping for guest encounters and hourly presentations about life along the ancient routes, from 11:00 am to 3:00 pm. Michele Belluomini of Blue Deer Storytelling tells traditional tales from Silk Road lands. Young dancers from Chinese For Families present a short program of Central Asian dance. Silk Road hand drumming demonstration with Joseph Tayoun. Classical Asian musician Kurt Jung performs on the traditional Chinese zither. Henna is a popular plant dye used to create body tattoos throughout India and other regions of the Silk Road. First come first served. 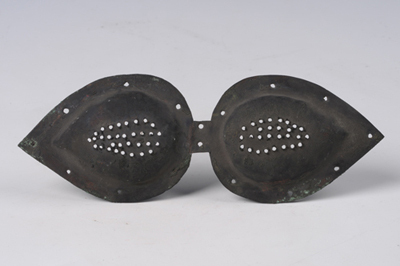 One of the most intriguing pieces in the Secrets of the Silk Road exhibition is called a "Bronze Eyeshade"—an ingenious precursor to our modern sunglasses—and is dated to the 7th to 9th centuries. Guests of all ages can create a pair of Silk Road sunglasses of their own to take home with them as a memento of the exhibition, throughout the day. A variety of specialty teas will be available including China Chrysanthemum, Tranquility Mao Feng, Keemun Hairpoint First Grade (one of the finest teas of China! ), and Makaibari Green Long Leaf. Sweets, inspired by recipes from all across the Silk Road, will include tempting items like Baklava from Iran, Asian Classics such as Saffron Rice Pudding, Sri Lankan Spiced Coconut Cake or even Afghan Elephant Ears. The café cart will also offer a pungent selection of popular Silk Road spices including cinnamon, peppercorn, ginger, turmeric, and cardamom. 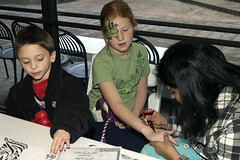 At a Pepper Mill Café craft table, children of every age may design their own teacup with paints, glitters, and beads. With every purchase of a teacup, guests receive a sample of gourmet tea! In these 30-minute presentations, Museum staff explore the wide range of mummies unearthed by archaeologists, from the earliest remains to more contemporary examples. In Explore the Silk Road, speakers from the Penn Museum's International Classroom Program consider ancient traditions along the Silk Road and their impact on modern cultures, with an interactive presentation that brings aspects of modern-day cultures vividly to life. Experiences may include demonstrations on how to make Chinese dumplings and paper cuttings, or wrap a sari and blend curry powder, or design a Turkish porcelain tile inspired by the Museum's collection. Speakers, and their countries, including India, China, and Turkey, change daily. These programs are co-sponsored by the Middle East Center, East Asian Center, and South Asia Center of the University of Pennsylvania. Before or after exploring Secrets of the Silk Road, visitors may follow a 12-stop, self-guided tour, "Silk Road Highlights," continuing the adventure with Silk Road connections in other galleries of the Penn Museum. The wide-ranging tour includes stops in the African, Chinese, Buddhism, Canaan and ancient Israel, ancient Mediterranean, Islamic Near East, and ancient Egyptian galleries. Activities are FREE with Museum admission.